Palladium Minotaurs resemble those of Greek & Roman myth, with a head of a bull and the body of a human. Many have taken to living underground in Palladium. They are famous for being formidable warriors. They are infamous for being the enforcers of the Old Ones, and are still associated with them. Surprisingly 50% are vegetarians, and all actually enjoy grass, grain, vegetables & fruit. 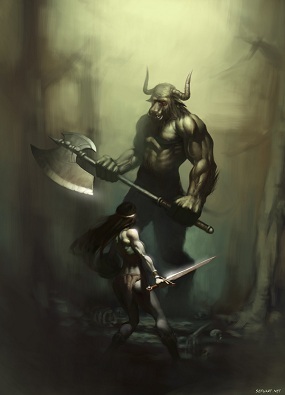 Xerx’ses is a Minotaur serving in CrIsis.